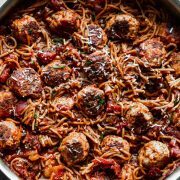 Studded with chicken and veggie-laced meatballs, nutty whole-wheat noodles, and a classic red wine-based spaghetti sauce, this One Pot Healthier Spaghetti and Meatballs is sure to keep your family warm all winter long. 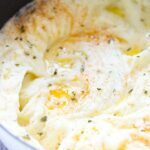 Even when it’s quick and easy, versatile, and inexpensive, I still have to dirty up more than one pan, no matter what. Ok, so there’s only one thing I don’t like about pasta. Which is basically nothing. 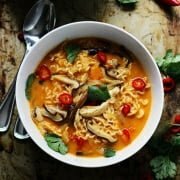 And admittedly, I don’t really mind having to use one, two, three or even four different cooking vessels for a stellar end product, but when I am looking to throw together a quick and easy meal, I think it goes without saying, I also kind of want to do as little dishes as possible in the end. 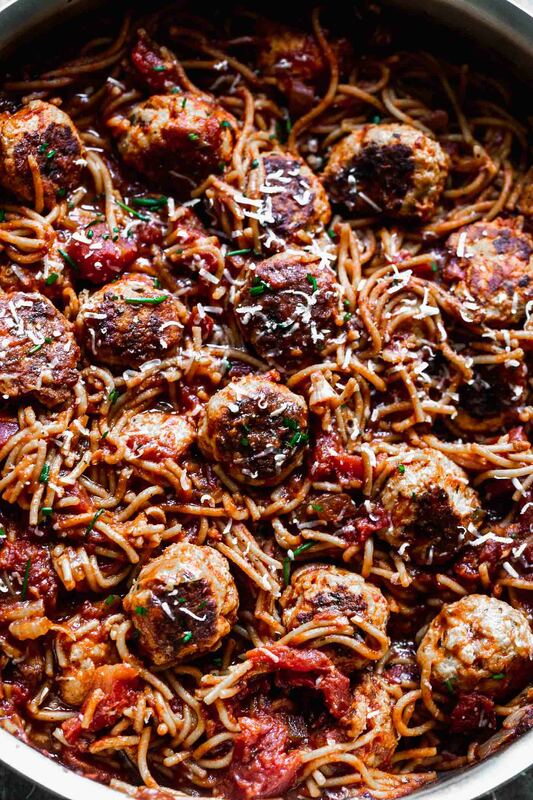 Say hello to One Pot Healthier Spaghetti and Meatballs. Another spaghetti and meatball recipe? Like most of America, spaghetti and meatballs is one of our favorite fall comfort food meals, solidified by the trio of recipes I already have on the website (not including today’s). The first is a classic version made with ground beef, Italian sausage, no shortcuts, and no calorie cuts. The second is a healthier version made with chicken meatballs, whole wheat pasta and the exact method as the original. 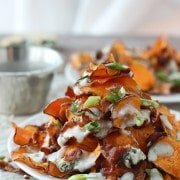 The last recipe is a super quick, full-fat version with only six ingredients. All different, all equally delicious, but still not filling one last spaghetti-and-meatball void — healthy, quick and ONE POT. 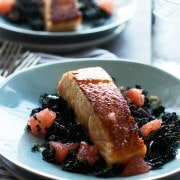 Basically, I took all of the fundamental of the three recipes — classic preparation, healthy base, and quick cooking — and turned it into one perfect recipe that only uses ONE pan. 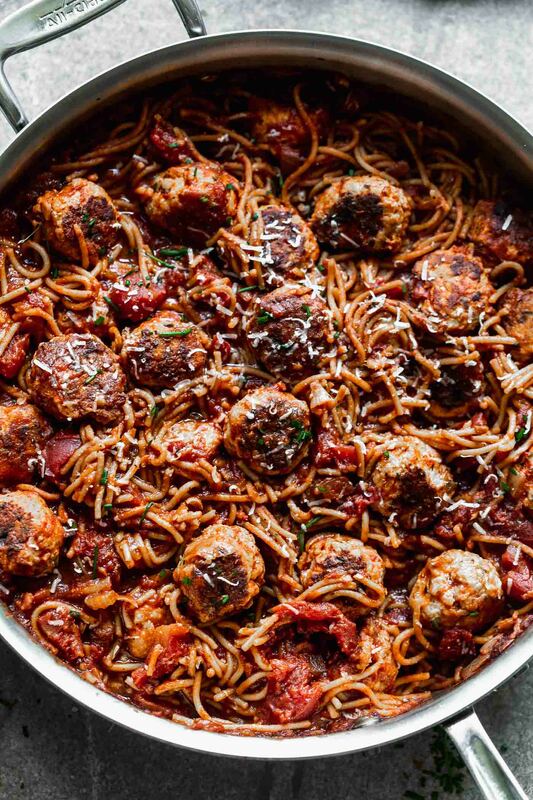 Yep, the meatballs, sauce, AND spaghetti all cook in one pan. Minimal mess, less calories, and maximum flavor. 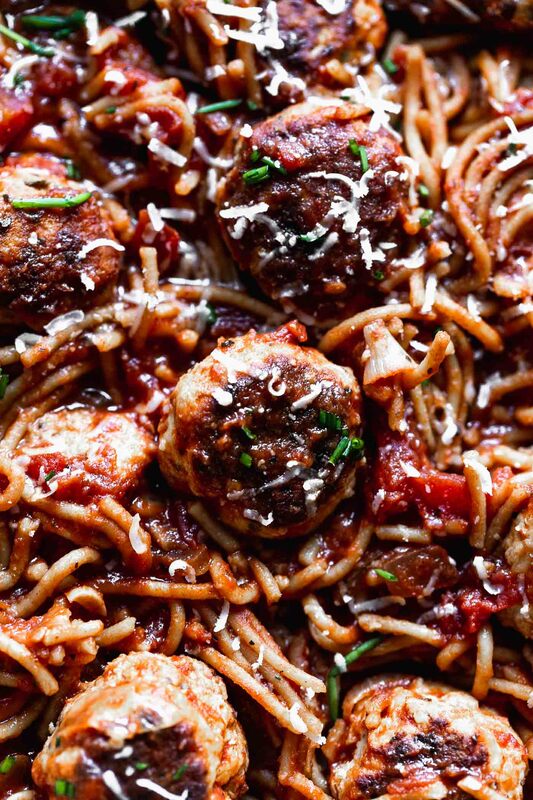 At the base is, arguably the most important part of spaghetti and meatballs – the meatballs. Since healthy was one of my ultimate goals in this recipe, that’s what these guys are. 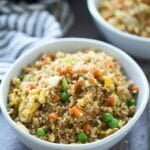 They’re packed with lean ground chicken breast, lots of “hidden” vegetables, and plenty of onion and garlic for flavor. They also have one egg, parmesan cheese and juuust enough breadcrumbs to bind everything together and to facilitate a nice light meatball. PLENTY of salt is super important when working with a blank canvas like chicken breast, as opposed to freshly cracked black pepper where a little goes a long way. I use a small ice cream or cookie scoop to form each meatball into symmetrical little balls, and then brown them up in a touch of olive oil. What I love love love about these guys, is they aren’t limited to just spaghetti and meatballs. You can throw them in virtually any pasta or soup, and they’re also the perfect toddler/kid-friendly meal on their own. Also, when you’re browning them, don’t worry about cooking them all the way through, they’ll finish up after they go into the oven with the sauce and the spaghetti. Which brings us to the sauce! My all-time favorite spaghetti sauce is this version which uses tomato paste as the base, but since we’re cooking the pasta in the sauce, I needed a little bit more liquid, so I also threw in a 28-ounce can of crushed tomatoes (San Marzano are the best! ), along with a little bit of extra water. 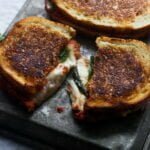 A good portion of the flavor comes from deglazing the pan with red wine before adding in the tomato paste, crushed tomatoes, salt, sugar, Italian seasoning, and the secret ingredient – a parmesan cheese rind. Once all of the ingredients are added in, the sauce is brought to a boil, the pasta is added, and then the meatballs are nestled on top. The entire pan is covered, popped into the oven and then bakes for about 20 minutes or so until the noodles are aldente. Oh! And before you add the pasta and meatballs back into the sauce, be sure to double check for seasoning, you may need to add more salt and Italian seasoning to taste. Just before serving, I pull out the parmesan cheese rind, toss everything together, do one more quick seasoning check, and then cover the top in grated parmesan cheese. 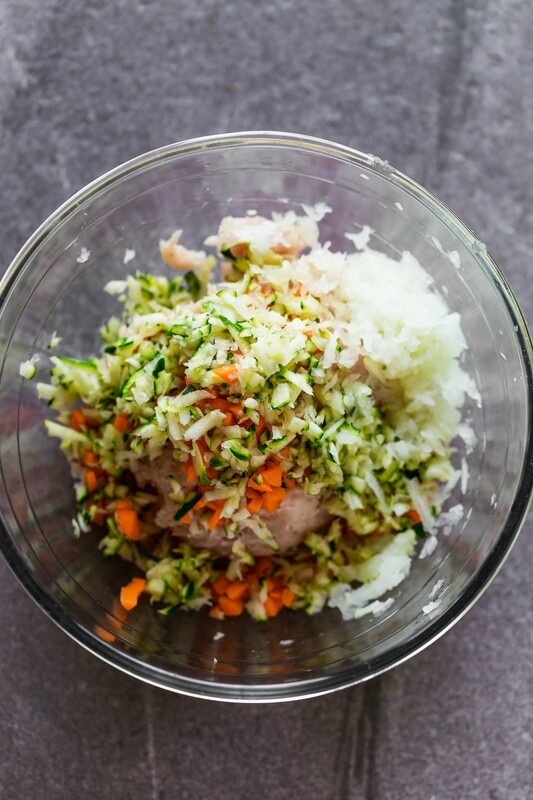 Add ground chicken, grated onion, carrot, zucchini, garlic, breadcrumbs, egg, 1/2 teaspoon Italian seasoning, parmesan, and 1 teaspoon salt to a medium bowl. Use hands to mix ingredients together, just until combined. Do not over mix! 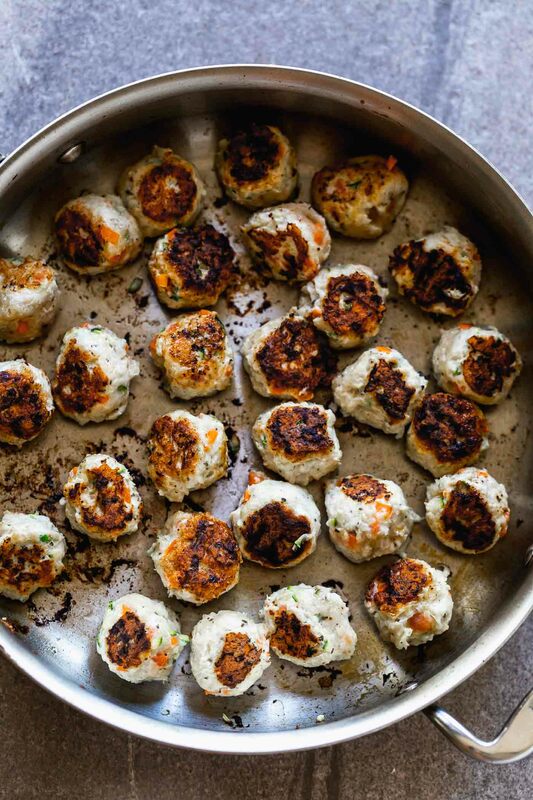 Use a small ice cream scoop to form into 30 meatballs. Yes, 30! Heat a large skillet to a medium heat. Add 1 tablespoon of olive oil, Once the oil is hot, add meatballs. Cook until brown on all sides, do not worry about cooking them all the way through. Once the meatballs are brown, remove from pan and set aside. Add remaining olive oil to the pan, followed by onion. Saute for 2-3 minutes until softened. Add garlic, cook 1 minute more. Add red wine. Use a wooden spoon to scrape up all the bits of meatball left on the bottom. Simmer wine until reduce by half, about 1-2 minutes. Whisk in tomato paste. Cook 1 minute. Whisk in canned tomatoes, sugar, salt, Italian seasoning and water. Add parmesan cheese rind. Season to taste with salt and pepper. Break spaghetti into thirds. Add pasta to sauce. Use tongs to toss. Make sure all of the noodles are under sauce. 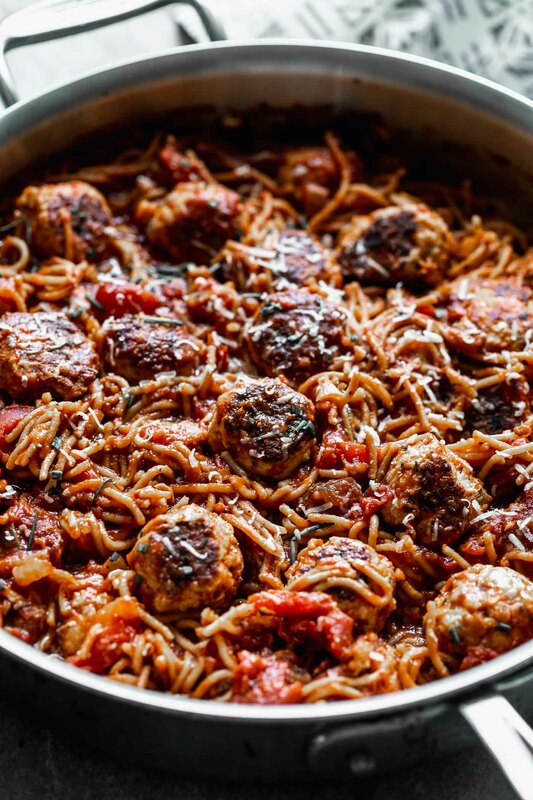 Nestle meatballs in sauce and on top of pasta. Bring mixture to a boil, and then reduce to a simmer. Cover and simmer for 10 minutes, remove lid and toss noodles in sauce. Cover and continue to simmer for another 5-10 minutes or until spaghetti is aldente. Use tongs to toss pasta in sauce one more time. Remove parmesan cheese rind. Season to taste with salt and pepper. Garnish with chopped parsley and grated parmesan cheese. 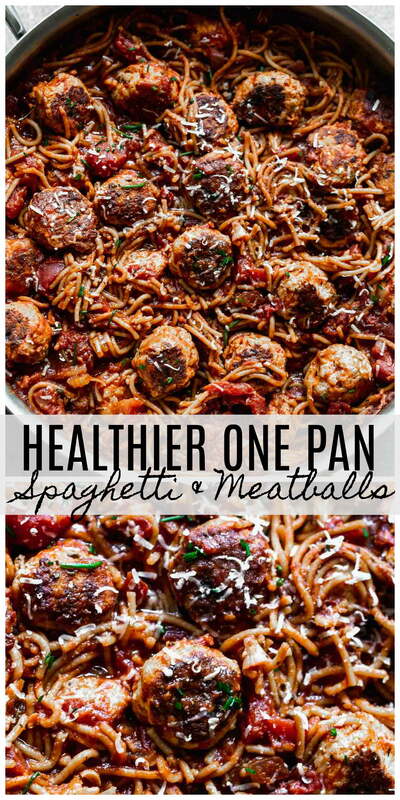 One Response to "One Pot Healthier Spaghetti and Meatballs"
Love that you have made this classic meal into a much healthier version! Thanks for sharing!